"My Message to Elvis": You will alwys live in the heart of millions no matter whether you sing at concerts or not. you will never die in the heart of your fans. : Hard to pick a song..I do love his slow songs. Why because he puts so much into them you would think he is singing them just for you. : Gold suit — I have a large picture with his Gold record in the gold suit. Millions of fans could not be wrong. : Living in sydney — feeding my son. : Once you are a fan — always a fan — in life or death. : My biggest dream is to go to Graclands — it will happen before I leave this earth. :: My Searest Elvis,As long as I am still on this earth, I will always be your fan. In the 2nd life I would love to meet you as I never got a chance in this life. : Live In Victoria, Australia. Have been a fan of Elvis since early 60's when I was only 5- 8. Always will be a fan, have your pictures all over my house. : doing a fantastic job — every fan would appreciate your site so much. Keep up the great work. Thank you for your kind comments on my site. 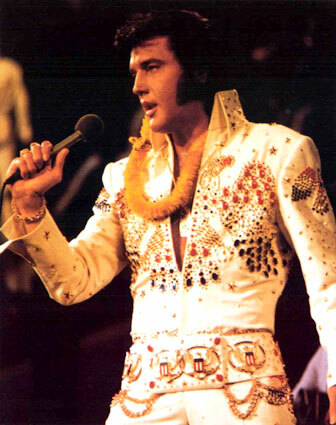 Elvis was an amazing performer with great looks and a wonderful generous personality. He is still deep in our hearts that will never change. I agree it`s hard to pick only 1 song; he has so many beautiful songs! & Yes, it feels like Elvis is singing only to you. Glenda, I hope you have the chance to make it to Graceland. It`s also a longing wish I have; I also live in Victoria, Australia. Elvis is on a golden pedestal treasured by his fans Forever!